The House of Comfort Art Network, Inc. (ARTHOC) in collaboration with Yuchengco Museum and with funding support from the National Commission for Culture and the Arts (NCCA) will conduct training workshops on creative intervention on November 18-19, 2011 for teachers, NGO workers and advocates and on November 25-26, 2011 for students, youth volunteers and street educators at the Yuchengco Museum. The training workshop is being held in conjunction with the premier showing of the House of Comfort installation (HOC) under the banner of the Nothing to Declare exhibition (https://nothing2declare2011.wordpress.com/), which will run at the Yuchengco Museum from November 16, 2011 to January 29, 2012. Made out of grids contributed by communities all over the Philippines, the House of Comfort was conceptualized by Alma Quinto for the trauma, interrupted exhibition, shown at the Cultural Center of the Philippines in 2007. Built by children, women, artists, journalists, teachers, and all others who were affected by natural and man-made disasters, the house is going to be shown for the first time. With the training workshops at Yuchengco, Quinto hopes to share her knowledge and skills in conducting similar workshops that aim to empower individuals by building their resilience and honing their creativity and imagination despite the odds. “With the changing climate and its effects on our communities and the occurrence of human-inflicted abuses which cause trauma among the vulnerable groups of people, the more reason that we should get involved in creative psychosocial intervention as a way of helping affected communities,” she states. Artists-teachers and a psychotherapist who are active and passionate in their advocacy work with marginalized children and women are expected to conduct the 2-day workshop for each group. There will be sessions on creative psychotherapy, creative writing and storytelling, theatre arts and visual arts as a way to surface feelings, thoughts, experiences and dreams for the future. A registration fee of P600 for teachers, NGO workers and advocates and P500 for students, youth volunteers and street educators will include 4 snacks, workshop kit (1 storybook, drawing/writing pad/journal, a CD of all the powerpoint presentations and other relevant data, House of Comfort art catalogue and a hand-stitched bag) and a certificate of participation. You may deposit your payment at Banco de Oro account number 001070226341 payable to ouse Ho House of Comfort Art Network, Inc. on or before October 30, 2011. Please email a scanned copy or a photo of your deposit slip to titaneris.kidsahoy@gmail.com, neris_pabillo@yahoo.com or to almaquinto@gmail.com. For inquiries, please call Nerisse at 5459842 or text her at 09062952265. 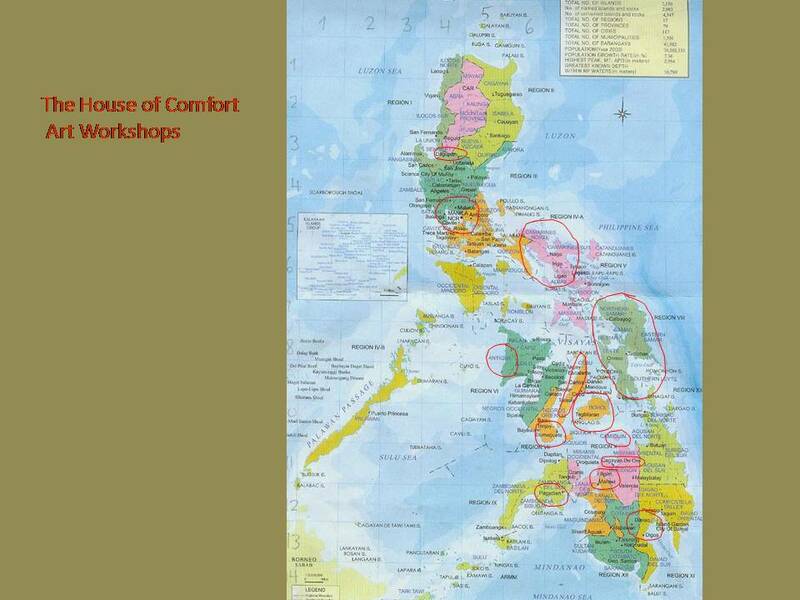 Building on the success of the House of Comfort workshops held with traumatized survivor communities from 2006 to 2007 through funding support from the National Commission for Culture and the Arts (NCCA), Japan Foundation and Global Women’s Fund, the team of trauma, interrupted – an international art project organized and curated by Flaudette May V. Datuin and a team composed of colleagues at the University of the Philippines Department of Art Studies (UP DAS) – have constituted themselves into an organization founded on the premise that art can be a powerful resource for empowerment and possible healing. 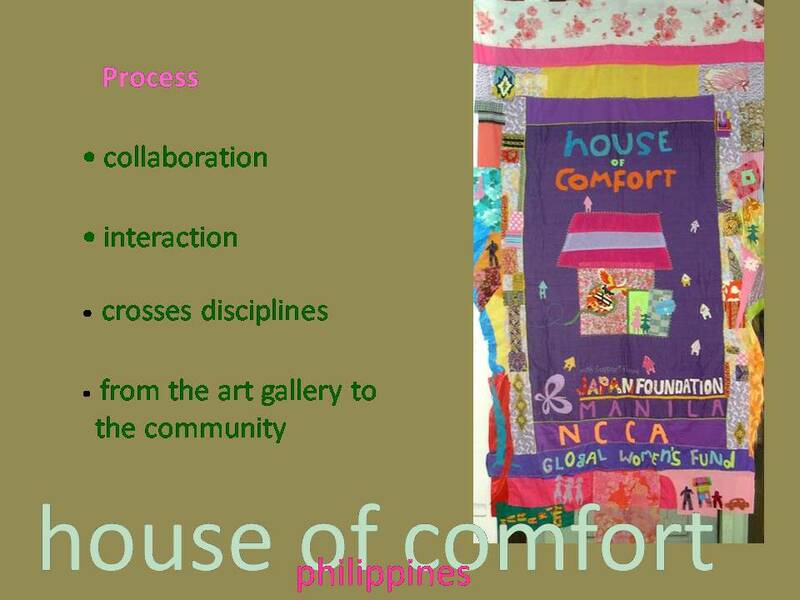 The organization, House of Comfort Art Network (Arthoc) is named after and emerges from Alma Quinto’s collaborative art project, House of Comfort, a textile-based, modular, and portable installation of a ‘dream house’ being built in collaboration with selected artists and marginalized communities all over the Philippines. The centerpiece of the trauma, interrupted project, the House of Comfort Art Project will premier in Manila in November-December 2011, under the auspices of Nothing to Declare. Dec 18, 2006 San Martin de Porres Orphanage, Bustos, Bulacan 17 orphans/abandoned children aged 6 to 8 who lived and worked in the streets of Manila before they were brought to the orphanage. Dec 19, 2006 San Martin de Porres Orphanage, Bustos, Bulacan 32 orphans/abandoned children aged 9 to 18 who lived and worked in the streets of Manila before they were brought to the orphanage. For a backgrounder and conceptual frame, here is one of Quinto’s essay on the project. The House of Comfort Art Project aims to build a dream house for survivors to help them rebuild their lives through their stories, dreams and art. It is a collapsible, modular, easy-to-install structure with a sala, bedroom, dining room, kitchen and a comfort room, with the artworks of participants, mostly made of cloth and all hand sewn, serving as roof, walls, windows and doors. All these parts of a house are slowly being built by participants of the art workshops supported by the Japan Foundation Manila Office, which continues to recognize my work with marginalized children since my participation as Philippine representative to the 2005 Yokohama Triennale, through my Ayayam exhibit, which was organized by the Japan Foundation. This project is an offshoot of my eleven years of working with abused children at CRIBS Philippines and other marginalized women and children in different communities. As I saw the need to bring together different groups doing advocacy work for children as well as to encourage more students to become aware of the issue of child abuse and volunteer themselves to help traumatized children, I thought of a project that strengthens community participation and collaborative art making. It is a major step in bringing art to the communities in different parts of our country and to expand the network so that cultural caregivers like us can easily exchange ideas, strategies and methodologies. The dream house started as a womb in the form of a mosquito net carrying thousands of messages related to pain, love and hope. This is actually the interactive component of my Ayayam project at the 2005 Yokohama Triennale. The womb evolved into a house, not of concrete and hard materials but of soft and comforting sculptures and tapestry works, envisioned to provide a space for interaction, dialogue, relaxation and play. This house is the centerpiece of the trauma, interrupted exhibition at the Metropolitan Museum in June 2007. 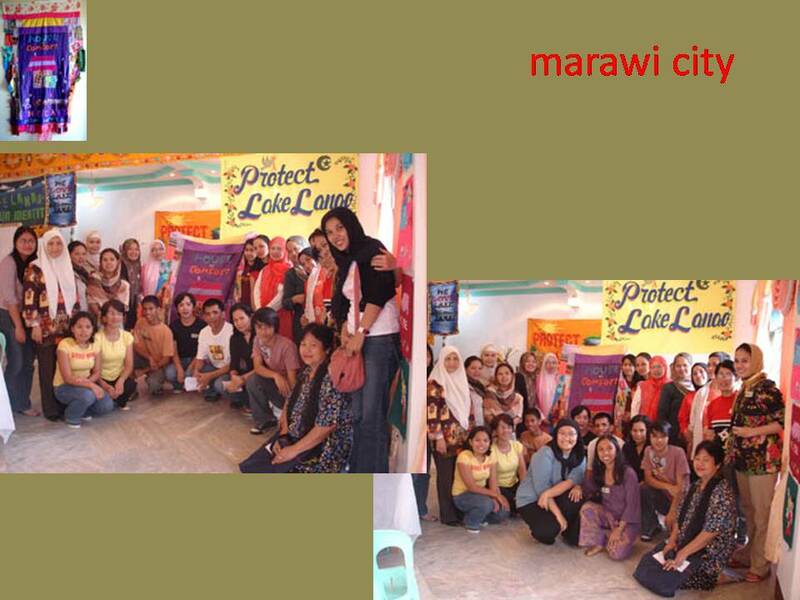 Through the House of Comfort workshops, I was able to collaborate with MAKALAYA women in Davao, with women migrant workers in Japan and Japanese-Filipino children of DAWN (Development Action for Women Network) and with students from the University of the Philippines in Mindanao and Diliman and the Davao City National High School. 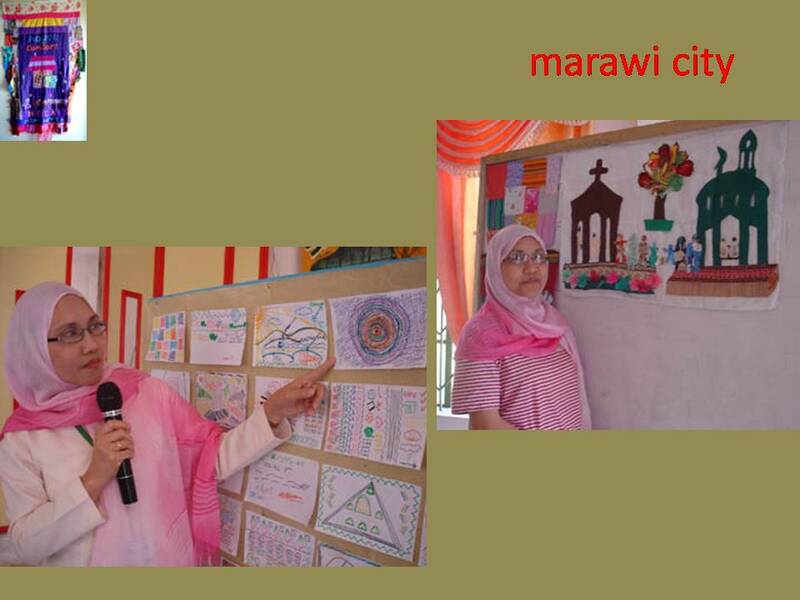 In Davao, we made the media a partner in disseminating our project. Sun Star, a major daily in Davao, featured our workshops as its cover story for its August 27 Sunday issue. Together with Japan-based Korean artists Soni Kum and Haji Oh, also participants in the trauma, interrupted exhibition, we conducted workshop from August 18-20, 2006 with 15 women of MAKALAYA, mostly mothers but some are community leaders, who live in the coastal areas of Davao City in poor housing condition, usually flooded during heavy rains. They stitched their dreams on cloth as they tell their stories of displacement, disaster, day-to-day struggles, and triumphs and discuss issues such as the use of air spray in banana plantation and domestic violence. After the workshop, we visited some of the women in their homes and interviewed them about their life and struggles as women. Cecile Villarente, National Vice-Chair of MAKALAYA for Mindanao, helped us coordinate the workshop and arrange our accommodation in Davao City. The workshop with 30 high school students of the Davao City National High School on August 22 and 23 was made possible through my active network with the Department of Education and the help of Amelia Lacerna and Dr. Gloria Labor, Schools Division Superintendent. As with MAKALAYA, whom I worked with since 2001, I have been involved with the Department of Education as Resource Person for its national training for teachers and students on art and peace education. Our artist talks and film showing at Kublai Millan’s art hotel in Davao City on the night of August 20 for a small group of journalists, writers, cultural workers and artists, who gathered after the Kadayawan festivities, engaged us on an intimate discussion of art and advocacy, art and community, art and gender and art and politics. This exchange was coordinated by Rosalie Zerrudo, an artist/organizer and coordinator of Enigmata. We also experienced the same level of interest from 60 students and faculty of UP Mindanao when we had artist talks and art workshop in the said university, thanks to the coordinating works of Abraham Garcia, Jr. and the full support of Chancellor Ricardo de Ungria, Vice-Chancellor Gilda C. Rivero, Dean Antonio Moran, the faculty of the Department of Humanities and Social Sciences and the student organization MITANDI & KIRIM. From Davao, the House of Comfort project continued its journey as it touched base with 20 female art students from the UP College of Fine Arts in Diliman in a whole day workshop, which begun with my presentation of the project and my work with survivors. The participants were asked to draw their dreams as inspired by my advocacy work then shared these dreams to the group including their self metaphors and struggles. Their works on paper were later translated into textiles, combining what we brought with their own fabric scraps and discarded clothes. Prof. Marco Ruben Malto II, Chairperson of the Department of Studio Arts and Ruben FM de Jesus, College Secretary, gave their full support to the project. Being a lightweight and mobile art project, the materials (textiles, scissors, pins, needles, paper, colored pens, masking tape, and white glue) of the House of Comfort can easily fit into a medium-sized plastic bag. Thus, it is easy to carry and bring to different venues. After the Diliman workshop, it went to Manila in a building just across the Philippine General Hospital. In an office room converted into a workshop area by DAWN, I had a 4-Saturday session in September with 10 women who were previously migrant workers in Japan. Through their metaphors of self, they were able to share their struggles as women and mothers at home and in Japan and through their dream tapestry, they found their strength as they envision harmony, peace and security in their homes as single parents. 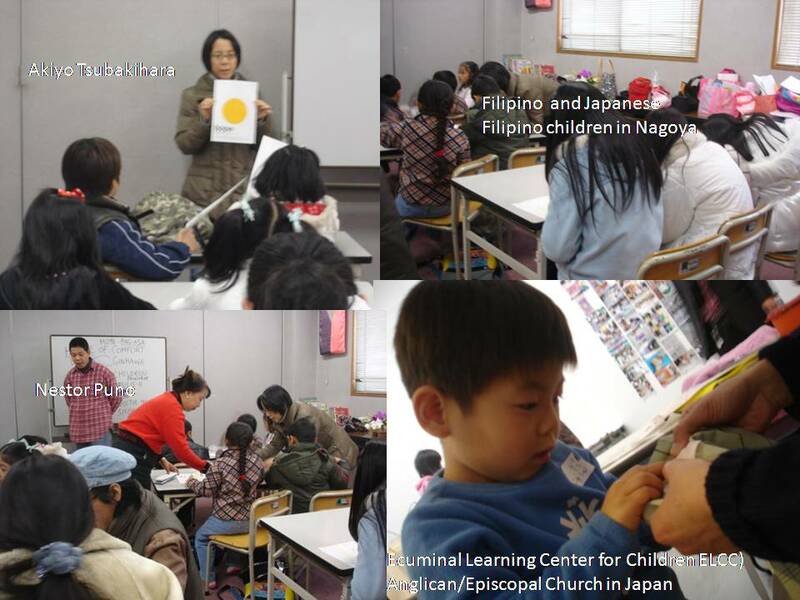 Another workshop with DAWN took place in November with 10 Japanese-Filipino children (JFC) who visualized themselves as future singers, engineer, preacher, professionals and caretaker of animals in their dream tapestries as well as having a playground at home. One made a fabric collage of Mt. Fuji, an airplane and Japanese flag because he dreams of going to Japan and another saw herself as a sakura flower because “it is a wonderful flower and can inspire other people like me… by the simple things that I do.” Carmelita Nuqui, DAWN’s Executive Director, recognized the power of art in rebuilding fragmented selves and hopes to organize more art workshops for their women and JFC members in the future. Thus, the House of Comfort does not only expand and grow. Like the sakura flower, it inspires. 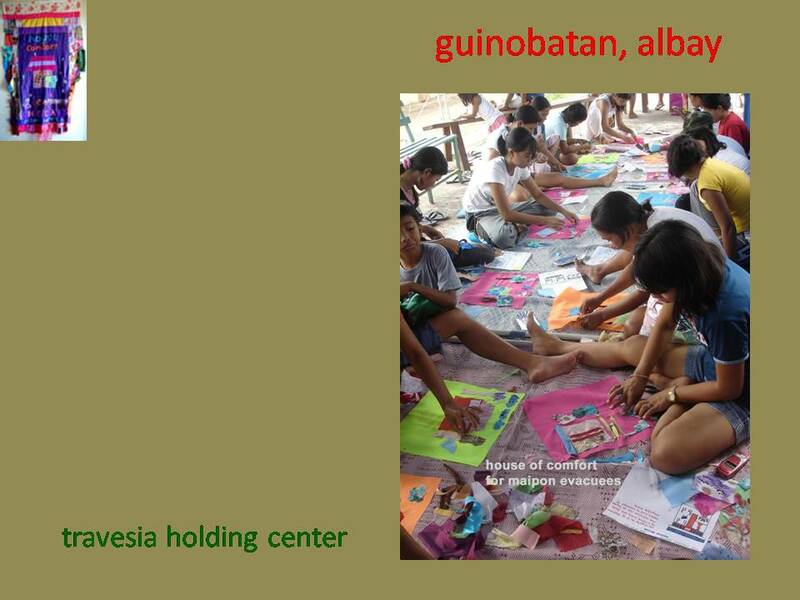 Alma Quinto’s advocacy as an artist-educator is to break the barrier between art and its audience in order to redefine art as a dynamic force that promotes collaboration and interaction with communities especially with women and children disadvantaged by socio-economic realities, gender inequalities and natural disasters. Her House of Comfort project is touching base with more communities all over the country and has evolved into an NGO, the House of Comfort Art Network, which she co-founded with Dr. Flaudette May Datuin, project leader and curator of trauma, interrupted. A pleasant day to you. I’m Julie Ann Flores. I’m currently enrolled in University of the Philippines Open University “Community Mental Health Course”. Dr. Dinah Nadera, my professor said that you’re having an Art program this November 18-25 2011? One of our requirements is to make a Community Mental Health Plan. My program is about Mental Health Awareness, Wellness Promotion (Stress Management) and Mental Illness prevention (Coping Skills) through Music and Art Therapy for Adolescence. I heard that you have a training workshop (The House of Comfort Art Network, Nothing to Declare) this year, about creative psychosocial intervention . Is it still on going? Coz I’m interested to join for my project. Can you give me information on how to pay and register? Thank you so much! and God Bless!!! Hi, Joyce. thank you for your interest and your queries. Please deposit your payment to Banco de Oro account number 001070226341 payable to House of Comfort Art Network, Inc. on or before October 30, 2011. Do not forget to email us a copy of the deposit slip with your name written on it and please bring the original document with you on the day of the workshop. We can only accommodate 50 participants.